MS Agent is a technology that enables a programmer to perform text-to-speech synthesis. Below is a screenshot of the standard character "Merlin" that comes with MS Agent. Before you can use this view you will have to generate the cAgent Class from within the IDE. Click Ok on the "Select methods and properties" popup to accept all. After that you can import the View by registering it as an external component. Now before you begin you may need to change the animated character's name and location on the oButtonStart_... buttons. I used 3 different characters. Any one of them can be actived by clicking on one of the three "ButtonStart" buttons on the left hand side of the view. Change this line: move "c:\winnt\msagent\chars\merlin.acs" to sCharacterid and make it match with the location of the character on your system. Change this line: move "MERLIN" to sCid this is the name of actor inside merlin.acs. MS Agent is seen by MS as part of the operating system, hence there is no uninstall. NT4 does not have all the characters used in here installed by default. You can load additional characters from the MS Agent Character Data pages below. Make sure to read all the MS licenses before you add this to your applications. If for some reason you are unable to select all 3 characters, then you can try to change the default character. 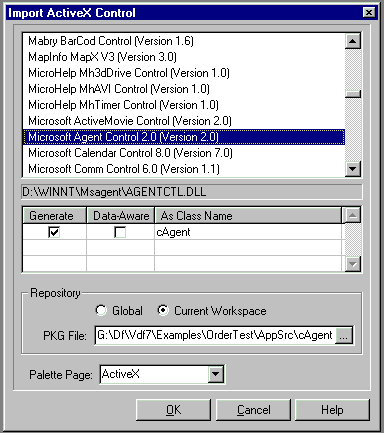 The MS Agent engine will show the default agent when it cannot locate the specified agent.